St Paul's Catacombs in Rabat. Photo: Chris Sant Fournier. The Jewish catacombs in Rabat were at the centre of controversy in recent days after Heritage Malta called in police when a Jewish religious delegation allegedly entered the site without authorisation. The Jewish community in Malta is demanding that the human bones found inside the catacombs are given a proper burial according to Jewish rites. A Jewish delegation made up of at least 10 experts, Rabbis and archaeologists from Israel and the US was brought over to Malta by the Jewish community to carry out the burial. Heritage Malta CEO Luciano Mulè Stagno confirmed that a Jewish delegation last week entered the site without authorisation, a claim denied by a representative of the Jewish community in Malta. "We lodged a police report and for some time a policeman was also placed on guard outside the entrance," Dr Mulè Stagno said. Lawrence Attard Bezzina, a representative for the Jewish community, denied that the delegation entered the site unlawfully. "We were scheduled to meet Heritage Malta and the Superintendence of Cultural Heritage at the site. The gate was open and since it was raining, the delegation entered into the property to be shielded from the rain. The moment they were asked to leave by the person on guard they immediately left," he said insisting that at no time did they dispute the instructions given to them. Mr Attard Bezzina said the Jewish community had long been asking the Maltese authorities to grant them the right to give the human remains a proper burial. "The bones are scattered around and for us that is a sacrilege. We brought over experts from Israel and the US to work under the supervision of the superintendence so that the remains are granted a proper burial," Mr Attard Bezzina said. According to Jewish rites, Jewish remains should be handled by Jewish people. Mr Attard Bezzina and Dr Mulè Stagno confirmed that both sides were in talks to find a solution to the impasse, while the Office of the Prime Minister has also been dragged into the controversy. "We are seeking an agreement that respects their requests but is also in line with Maltese legislation. The Jewish community are looking at the site purely in religious terms as a burial site. We concur with the idea but for us it is more than just that because it is an important archaeological site of unique value," Dr Mulè Stagno said. The site, which is across the road from the entrance to St Paul's catacombs, has never been open to the public and is currently being restored by Heritage Malta with EU funds. The Jewish catacombs form part of the larger St Paul's catacombs complex in Rabat and were discovered at the end of the 19th century. They date back to the late Roman period some 1,500 years ago and are unique since they are Jewish catacombs within a Christian complex. "The catacombs are also the only evidence of the presence of a Jewish community in Malta at the time. It is an important archaeological site for us," Dr Mulè Stagno said. He said Heritage Malta insisted that everything should remain on site and that the site remained within the jurisdiction of the State. For the Jewish community, the site is government property but the bones are not. "We cannot permit human remains to be left uncovered and scattered around. We want to find a place in the catacombs themselves in agreement with the agency and give the bones a proper burial. 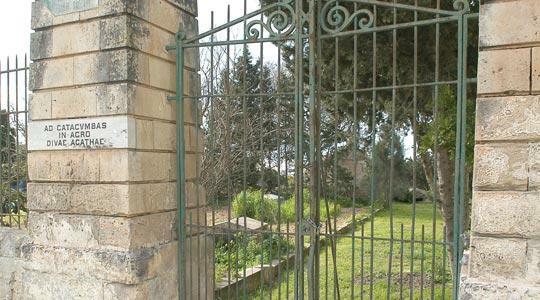 We are not asking for the catacombs to be closed or barred to the public," Mr Attard Bezzina said. The Office of the Prime Minister would only say that Heritage Malta was having talks with the Jewish community to "reinstate the archaeological skeletal remains at the St Paul's Catacombs". "Heritage Malta welcomed the request made by the Jewish Community and a mutual agreement is being outlined," a spokesman for the OPM said, without going into how it was dragged into the issue. However, Mr Attard Bezzina confirmed that he had asked the OPM to intervene. "We are a small community and for some reason or another our requests were being ignored until the OPM got involved in the issue," he said. Another meeting between Heritage Malta and the Jewish representatives is scheduled for tomorrow in a bid to clear the last details of the agreement so that the burial can go ahead.